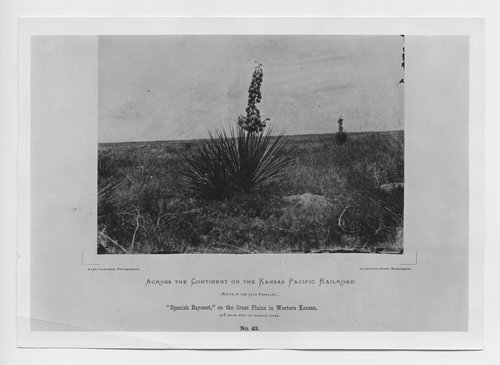 This is aphotograph of a Spanish Bayonet or yucca plan on the Great Plains of Western Kansas. The photograph was taken 418 miles west of the Missouri River on the route of the 35th paraellel. Alexander Gardner photographed the Union Pacific Railway, Eastern Division, as it was being built across Kansas. Along the route he documented towns, forts, rivers, wildlife, plants, and landscape. This is from a series titled Across the Continent on the Kansas Pacific Railroad.